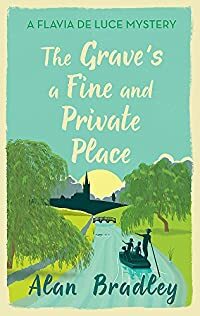 The Grave’s a Fine and Private Place by Alan Bradley was published earlier this year, but I have seen it reviewed by so many other bloggers that I had somehow convinced myself that I had already read it, it was only a couple of weeks ago that I realised I was wrong about that. Luckily I was able to get it quickly from the library, unluckily I also discovered a lot of other interesting books there that I just had to take home with me – when I should be concentrating on my own books. Anyway, in the previous book in this Flavia de Luce series their father had died unexpectedly, I found it really sad and I know that that coloured all my feelings about the book. In this new one all three de Luce girls are dealing with the shock of losing their father and the uncertainty of their futures. If bossy Aunt Felicity gets her way there will be even more changes in their lives. They’ve been persuaded to go away for a summer holiday and as the trusty Dogger is punting along the river, Flavia takes to trailing her hand along the water, of course in no time at all her fingers have hooked a corpse and so begins the mystery. When they get the body out onto the riverbank they can see that it’s a young man dressed in 18th century clothes, a ruffled silk shirt, silk trousers buttoned at the knee, was he at a fancy dress party? It turns out that he’s well known locally, Orlando has been a bit of a problem at times. Flavia of course wastes no time in beginning her chemical investigations, all very detailed and I always ask my own resident organic Chemistry PhD guy about the chemistry involved, and it’s always correct. I think I enjoyed this one more than most other readers. I liked that the relationship between Flavia and her sisters is maturing and becoming more understanding, as it should, and also that given when the story is set – the 1950s – when we still had the death penalty in the UK this book involved a miscarriage of justice, which is one of the reasons that hanging became so obnoxious to the general public. I think sometimes that people forget that several innocent people were hanged back in those more brutal times. 12th, December, edited to add – I noted several incongruous words in this book. Although Alan Bradley lives in the UK and his Flavia books are set mainly in the UK his Canadian origins show through several times in this book. Particularly on page 155 he writes that – On a raised platform, a tall thin man with a bare chest, but wearing suspenders, was swallowing a sword for an audience of two small boys who were fighting over a bag of apples. That word suspenders is presumably meant to mean what we in the UK call braces or in Scots galluses. Suspenders in the UK are those ghastly looking things that some women use to keep their stockings up – and a certain sort of man finds enthralling! So I did have a bit of a laugh over that little bit of description. As ever I enjoyed this book because I love Flavia as a character but this one does suffer from a lack of family banter between Flavia and her older sisters, and even Dogger didn’t seem to appear that often. Also I didn’t appreciate the ending at all. There have been too many actual exits of ‘big’ characters in 2016 and I could certainly be doing without fictional ones too! Don’t worry. It wasn’t Flavia. I suppose I could take up reading Mills and Boon books – but that might be taking it a bit far. This is the fourth book in the Flavia de Luce series and although I enjoyed it I didn’t like it as much as the three previous ones. I must admit that I was only half-way through it when we left for our holiday in the Netherlands and it was two weeks before I got back to it so that might have had something to do with my feelings on the book. However, Flavia is concerned with Santa Claus, setting traps for him so that she could have some evidence of his existence. I just can’t imagine such a smart girl as Flavia obviously is having any belief in that jolly old mythical gent. I’m not a fan of duping kids into believing he is real – that’s probably me being an old curmudgeon – but there you go! Anyway, the de Luce family home Buckshaw has been hired out by their father to a film company, in a bid to help the family finances. Buckshaw is filled with film crew and film stars but it isn’t long before a series of accidents slows down the filming and there’s a murder! I did enjoy it but I’m at a bit of a loss to know why Alan Bradley uses the word ‘foyer’ throughout these books when he is writing about the hall in Buckshaw. The word foyer always reminds me of hotels or theatres, definitely not what you would find in a large, grand house. He also uses the word ‘afghan’ when he means blanket or throw. The word afghan is used in America or possibly Canada – nit picking I know, but words interest me, and their different meanings in different places. If you mention the word afghan in Britain it conjures up the image of an afghan hound, which is admittedly better than a blanket anyday. I’m still looking forward to the next book in this series. I have blogposts piling up in my brain like multiple snow drifts, so I’m just mentioning two of Alan Bradley’s Flavia de Luce series, numbers 2 and 3. For once I was determined to hang off and get the books read in order and I’m glad that I did as Flavia’s relationship with her family and in particular her sisters is developing nicely. The Weed that Strings the Hangman’s Bag involves a travelling puppet show. The couple who are performing are well known to everyone with TV as they are on the BBC and so the villagers are all desperate to see the celebrities in the flesh – but of course there’s a murder and Flavia rides to the rescue on her trusty bike Gladys again. Not only are these books enjoyable tales with some great characters but there is some lovely writing too, lots of description to help you picture the scene such as: Bright cobwebs hung suspended like little portcullises of light between the rotted tree stumps. I was absolutely there in that bluebell wood with her. The third one A Red Herring without Mustard was equally as good. At the village fete Flavia goes into a gypsy tent to have her fortune told, for a bit of a laugh of course but the gypsy mentions ‘seeing’ Flavia’s dead mother Harriet and that’s a subject which is bound to grab Flavia’s interest. Flavia is always about five steps ahead of the police it seems but Inspector Hewitt isn’t one to take umbrage at that. I’ve been indulging myself with this series recently but I think I’ll be taking a wee rest from them, apart from anything else I’ll have to request number 4 from the library. Speaking of which, I now have 8 books out on my library ticket – and I’m supposed to be concentrating on my own books! How did that happen? Anyway – it did happen and I came across a Susan Hill book which fortunately for me was not the beginning of the series otherwise I would have had 9 books out. I’ve been thinking of trying her Simon Serrailler series, have any of you read them? 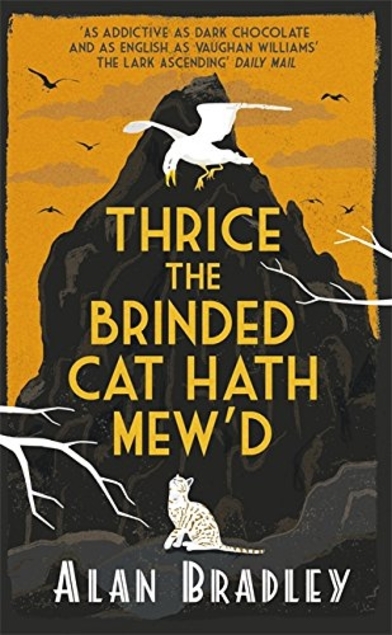 It’s ages since I’ve read anything by Susan Hill and in the past I’ve found her books to be a bit ‘curate’s eggish’ in other words – good in parts – but sometimes disappointing. The Sweetness at the Bottom of the Pie by Alan Bradley has appeared in a few of my favourite blogs and has always been adored by the readers (my pals!) so I was fairly sure that I was in no danger of finding this book to be a dud – and of course it wasn’t. In fact I’m already reading the second in the series and have the third one from the library. Set in England in 1950, Flavia de Luce is the youngest in a family of three daughters, their mother Harriet died in a climbing accident and Flavia has no memories of her. Their father is a remote, withdrawn character, as were most fathers at that time. The girls are very much left to get on with things on their own which is something that their father might not have done if he had had an inkling of just how nasty elder sisters can be to their much younger siblings. I know because I’m a third daughter myself! Never fear though, Flavia gets her own back, she’s a great character and with her love of chemistry it’s a brave or stupid person who crosses her. I never particularly wanted a daughter (it’s all that pink girly stuff which put me off that idea) but if I had had one I would have wanted her to be like Flavia. When Flavia discovers a dying man in the garden she becomes involved in a mystery which had its origins years before she was born. She always seems to be a few steps ahead of the police and with the help of her trusty bike Gladys and an old family retainer called Dogger she solves everything. There’s quite a lot of chemistry in the book and if I’m reading about something which I don’t know much about myself I’m always wondering how correct the information is. So each time a chemical was mentioned I asked my trusty resident Chemistry Ph.D guy (Jack) and I’m glad to say that it was all correct. I enjoyed being in the company of Flavia so much that I began to read the second one in the series straight after finishing this one. Hurrah for libraries!